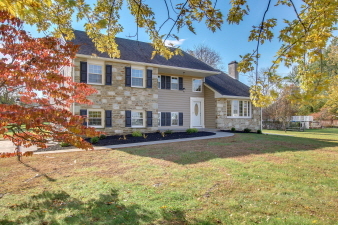 Magnificent 3200 Sq.ft stone front, 5 Bedroom, 2.5 Bath, Custom multi-level Colonial with open 1st floor concept sitting on approximately 1 acre corner lot into Whisper Way. Nothing spared in this newly renovated luxury home! Two-story covered patio opens to two-story foyer which flows into Living Room with custom stone fireplace and over-sized bow window. Living room opens to expanded gourmet kitchen with center island breakfast bar, which seats four. Custom full overlay, custom Perla Maple cabinetry with custom crown molding, recessed lighting, glass block backsplash, custom granite countertops, and upgraded Frigidaire Gallery stainless steel appliances, 5 burner gas range with overhead microwave, stainless steel built-in dishwasher. 9 lite insulated door from kitchen leads to 16’ x 14’ custom deck.